NH Hosts Game 1 Wed. and Game 2 Thu. Manchester, NH - The New Hampshire Fisher Cats (Blue Jays Double-A affiliate) begin their first playoff run since 2011 on Wednesday at 6:35 p.m., with Game 1 of the Eastern Division Championship Series against the Trenton Thunder (New York Yankees) at Northeast Delta Dental Stadium. 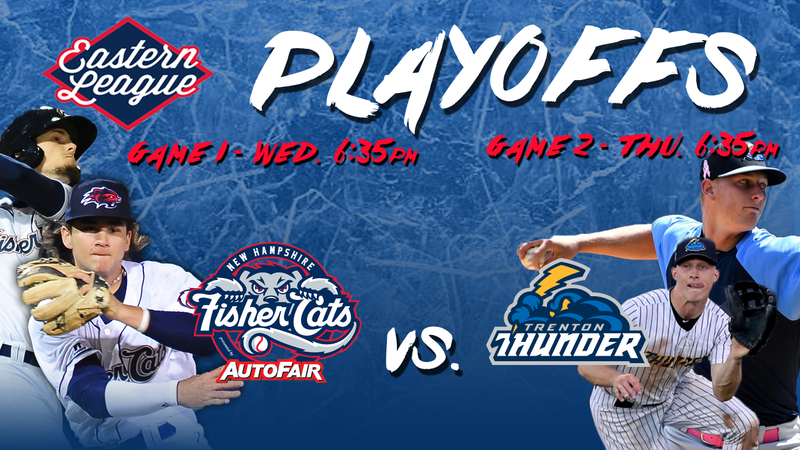 As the Eastern Division runner up, the Fisher Cats (76-62) will host the Thunder (79-61) in the first two games of the five-game series, and travel to Trenton for the final three. Trenton edged New Hampshire in the season series, 9-8, but the Fisher Cats dominated the final regular season meeting: a 12-1 blowout on August 19 in New Jersey. Statistically speaking, the five-game set will be a battle between the Eastern League's top offense and its best pitching staff. New Hampshire leads the circuit with a franchise record .272 team batting average, and has produced a league-high 5.08 runs per game. Trenton ranks 10th out of 12 with a .246 clip, and averaged the third-fewest runs per game (4.12). In terms of power, the Fisher Cats have seven current players with at least eight home runs this year; the Thunder have three. On the mound, the Thunder boast the league's best ERA (3.25), WHIP (1.23) and strikeout total (1,228), while the Fisher Cats find themselves in the middle of the pack in those categories (4.12 ERA, 1.38 WHIP, 1,035 Ks). Trenton finished the season with 10 wins in their final eleven games, holding opponents to an average of 2.1 runs per contest during that stretch. In their four-game Labor Day Weekend sweep of Reading, the Thunder outscored the Fightin' Phils 11-3 with back-to-back shutouts on Saturday and Sunday. New Hampshire spent 120 of the season's first 136 games with at least a share of first place, until a 5-5 finish dropped the Fisher Cats back into second. The Blue Jays and Yankees Advanced-A affiliates squared off in last year's Florida State League Championship, with John Schneider's Dunedin Blue Jays winning the title over Jay Bell's Tampa Yankees, two games to one. The managers will meet again in Double-A this year, along with several key players from the 2017 FSL postseason. For New Hampshire, it's SS Bo Bichette, 2B Cavan Biggio, 1B Juan Kelly, C Ryan Hissey and RF Connor Panas (who hit two homers in last year's clincher) at the plate, along with a host of pitchers including T.J Zeuch, Jordan Romano, Zach Jackson, Kirby Snead and Josh DeGraaf. Trenton's roster features several players from the 2017 Florida State League playoffs as well, including: SS Kyle Holder, 2B Gosuke Katoh, and LF Trey Amburgey, along with RHPs Albert Abreu, Matt Frawley, Brian Keller, Hobie Harris, Jordan Foley, and LHP Trevor Lane. While the Fisher Cats clinched their first playoff berth since 2011, the Thunder have reached the playoffs for a third straight year. Trenton advanced to the last two Eastern League Championship Series, but were swept by Akron (2016) and Altoona (2017) on both occasions. The two teams haven't faced each other in postseason play since the 2010 Eastern Division Championship Series, when the Thunder swept the Fisher Cats in three games, highlighted by a 1-0 win (12 innings) behind four shutout frames from MLB rehabber Andy Pettitte in Game 2. RHP Jordan Romano excelled in four outings against Trenton (2-1, 2.13 ERA), and was selected by Thunder manager Jay Bell to start the Eastern League All-Star Game at ARM & HAMMER Park on July 11. In 25.1 innings, Romano has held Trenton to a .176 batting average, while striking out 20 hitters against just four walks. Romano's first Double-A win came on April 11 in Trenton, when he allowed just three hits over seven shutout innings with no walks and seven strikeouts. The 25-year-old also made the full-season Eastern League All-Star Team, and was voted right-handed starting pitcher of the year. RF Harold Ramirez , one of New Hampshire's league-high six Full Season All-Stars, led the Eastern League with a .320 batting average in the regular season, including a .300 clip in 16 games against the Thunder. He added two homers, five doubles, and went 4-for-4 in stolen base attempts when facing the Yankees affiliate. LHP Travis Bergen has been practically unhittable out of the Fisher Cats bullpen, allowing just two earned runs in 35.2 innings (0.50 ERA) as New Hampshire's closer. The two runs: a solo home run on June 15, and a solo home run on September 1. Neither of those long balls came from Trenton; he's struck out nine Thunder hitters over 5.1 shutout innings, scattering five hits and three walks while securing a pair of saves. Eastern League MVP and Rookie of the Year 2B Cavan Biggio walked 16 times in 15 games vs. Trenton this year, while posting a .371 on-base percentage (despite being limited to a .156 batting average). The Blue Jays No. 9 prospect set a Fisher Cats franchise record with 100 walks this season, and slugged two of his league-leading 26 homers against Thunder pitching. In last year's Florida State League playoffs, Biggio hit a two-run single and a solo homer as part of pivotal 4-1 Game 2 win over Tampa. SS Bo Bichette, the No. 9 prospect in baseball (according to MLB.com) finished the season with a Fisher Cats record 43 doubles, and produced a .275 batting average with six doubles and a homer in his 16 games against Trenton. RHP T.J. Zeuch , New Hampshire's projected Game 1 starter, was dominant in his only meeting with Trenton this year. Only July 1 at ARM & HAMMER Park, he tossed seven five-hit shutout innings with two walks and four strikeouts, leading the Fisher Cats to a 4-0 win. 3B Jon Berti , who holds the Fisher Cats all-time records for career hits, triples and stolen bases, finished the regular season on a tear. Including his natural cycle on August 28, he wrapped up his fourth season in New Hampshire with 18 hits in 35 at bats (.514), and homered in Monday's season finale. RF Connor Panas was last year's playoff hero for the Dunedin Blue Jays, going 4-for-12 with three home runs in the three-game series. His two-homer performance in the decisive third game helped clinch the first championship in D-Jays history. LF Trey Amburgey was Trenton's lone Full Season All-Star selection this year, earning the honor with a .258 batting average, 16 HRs and 74 RBIs. The Fisher Cats have limited Amburgey to a .241 average in 16 meetings, and he was held to a 1-for-13 clip in last year's FSL playoffs. RHP Brian Keller, Trenton's projected Game 1 starter, has been a steady hand in the Thunder rotation all season. He's gone 10-9 with a 3.74 ERA, striking out 114 batters against just 37 walks in 125 innings. When facing the Fisher Cats, however, he's 0-3 with a 5.55 ERA in four starts, allowing home runs to Jon Berti, Harold Ramirez, and Cavan Biggio (2). Still, Keller's best outing against New Hampshire was his most recent: a no-decision on August 18 (7 IP, 2 R, 4 H, 1 BB, 4 K). LHP Phillip Diehl is just one name on a long list of impressive arms in Trenton's bullpen. Since being called up to Double-A on July 21, he's allowed just four runs in 26.2 innings (1.35 ERA) while striking out 29 batters. His only outing against New Hampshire came on August 17, when he threw 2.2 scoreless frames to protect a 3-1 lead. LHP James Reeves has shut down just about every team in the Eastern League this season...except the Fisher Cats. The lefty reliever has allowed just nine earned runs in 45.1 innings (1.79 ERA) to teams outside the Granite State. Against the Fisher Cats, he's given up eight runs in 9.1 innings (7.71 ERA) -- although five of those runs came on a pair of homers from Juan Kelly, who is currently on the Disabled List. RHP Nick Green , who lines up as Trenton's Game 2 starter, is coming off a spectacular start against the Western Division Champion Altoona Curve (Pittsburgh Pirates). He tossed seven one-hit shutout innings with two walks and four strikeouts, leading the Thunder to a 4-0 win over the defending Eastern League Champions. 1B Brandon Wagner enters the postseason on a hot streak, collecting hits in seven of his last eight games and batting .448 during that stretch. He was called up from Advanced-A Tampa on July 25, and has only played four games against New Hampshire (2-for-12, 3 BB). Tickets are still available for Game 1 (Wednesday at 6:35 p.m.) and Game 2 (Thursday at 6:35 p.m.) of the Eastern Division Championship Series at Northeast Delta Dental Stadium. Visit NHFisherCats.com or call (603) 641-2005 to reserve your seats. If the Fisher Cats win the best-of-five series with Trenton, they'll have home field advantage and host the final three games of the best-of-five Eastern League Championship Series against either Akron (Cleveland Indians) or Altoona next week.